SUBHEAD: Researchers measure most radioactive cesium emitted from Fukushima held in northern Pacific by Kuroshio Current. 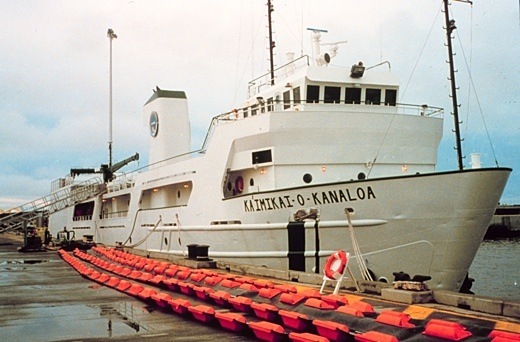 Image above: The Ka’imikai-o-Kanaloa, a scientific research vessel stationed in Honolulu and operated by the University of Hawaii used to sample Northwest Pacific Ocean contamination by radioisotopes emitted from the Fukushima Daiichi Nuclear Power Station after 11 March 2011. From (http://commons.wikimedia.org/wiki/File:Ka%E2%80%98imikai-o-Kanaloa_at_pier_-_Nur08523.jpg). The release of radioisotopes from the Fukushima Dai-ichi nuclear power plant in March 2011amounts to the largest-ever accidental release of radiation to the ocean. It came mostly in the form of iodine-131, cesium-134 and cesium-137, the primary radioisotopes released from the reactors, reported Ken Buesseler, a marine chemist at Woods Hole Oceanographic Institution. All of these substances can cause long-term health problems, said Buesseler, but iodine-131 has a half-life of just eight days and so would be effectively gone from the environment in a matter of weeks. It was cesium-134 and cesium-137, with their half-lives of two and 30 years, respectively, which would remain in the ocean for years and decades to come. In fact, most of the cesium present in today’s oceans, Buesseler noted, is armemnant of atmospheric nuclear weapons testing conducted by the United States, France, and Great Britain during the 1950s and ’60s. Lesser amounts are attributable to the Chernobyl nuclear accident in 1986 and to local sources, such as the dumping of low-level waste from England’s Sellafield nuclear facility into the Irish Sea. Prior to Fukushima, however, the levels of cesium-137 off the coast of Japan, as cataloged by Michio Aoyama at the Meteorological Research Institute in Japan and others, were among the world’s lowest, at around 2 becquerels per cubic meter (1 becquerel, or Bq, equals one radioactive decay event per second). Against this background, the concentrations measured in early April of 2011 were all the more alarming. At Woods the source waters closest to the Fukushima Dai-ichi plant operated by the Tokyo Electric Power Company (TEPCO), concentrations of up to 60 million becquerels per cubic meter were reported, high enough to cause reproductive and health effects in marine animals. Most of the cesium from Fukushima came from the millions of gallons of water poured onto the reactors during efforts to cool them, which subsequently flowed into the ocean as runoff or via groundwater. One major leak from flooded buildings at the plant also added cesium to the ocean. Once the leak was plugged in early April, cesium levels close to shore fell off dramatically, Buesseler said. They did not, however, fall out of sight. He hastened to put that number into context. “A thousand becquerels is not a big number for cesium. Just for comparison, that’s lower than the U.S. Environmental Protection Agency’s limit for drinking water. At that level, Buesseler stressed, the cesium in Japanese coastal waters is safe for marine life and for human exposure. Away from the coast in the open ocean, the radioactivity that showed up first came from fallout from the atmosphere carried out to sea by winds. The winds limited radioactive exposure on land, as more than 80 percent of the fallout fell on the sea. Only a few weeks after the accident, a research cruise undertaken by Makio Honda and colleagues at the Japan Agency for Marine-Earth Science and Technology, or JAMS-TEC, detected low levels of both cesium-137 and cesium-134 some 1,900 kilometers (1,180 miles) from Fukushima, from radioactive gases carried out to sea by winds. The importance of the shorter-lived cesium-134 isotope, Buesseler said, was that it offered definitive proof that the contamination had originated from Fukushima. Cesium-134 is not naturally present in the ocean, and it has a half-life of only two years. Any amount of it introduced by weapons testing or other pre-Fukushima sources would have long since disappeared. 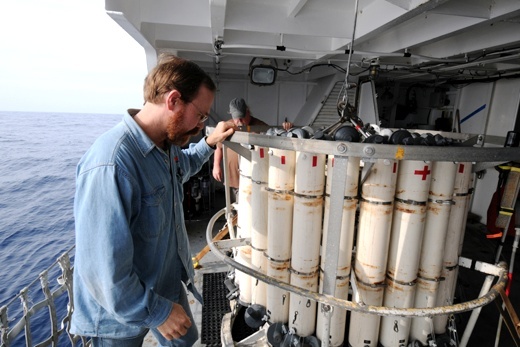 Image above: Marine chemist Ken Buesseler (foreground) checks a CTD sampler prior to deploying the instrument to collect data and water samples from the ocean off the coast of Fukushima, Japan. Photo by Ken Kostel, WHOI. From original article. In June 2011, Buesseler led a quickly organized expedition aboard the research vessel Ka’imikai-o-Kanaloa that took a comprehensive look at the fate of Fukushima radiation both in the open ocean and in marine life. Beginning 600 kilometers offshore and coming within 30 kilometers of the crippled nuclear plant, the research team sailed a sawtooth pattern, gathering water samples from as deep as 1,000 meters, and collecting samples of phytoplankton, zooplankton, and small fish. They also released two dozen drifters to track currents. These instruments move with ocean currents over months and report their positions via satellite. Like their Japanese colleagues, Buesseler’s team measured elevated levels of both cesium-137 and the telltale cesium-134 in the water they collected. These levels varied widely across the sampling area, however, which indicated the complexity of the currents at play—dominated by the mostly eastward flow of the mighty Kuroshio Current, the Pacific Ocean’s equivalent of the Gulf Stream in the Atlantic. “The first thing we noticed was that when we got to the Kuroshio, we lost the cesium-134 signal,” Buesseler said. “That confirmed that the Fukushima radioactive fallout from the atmosphere did not reach these more southern latitudes.” The scientists believe the Kuroshio acted as a barrier, blocking radioisotope-contaminated waters from flowing through it and to the south. As expected, he said, the highest levels of radioactivity were measured closer to the shore. Surprisingly, these high levels were found not at Fukushima but much farther south, off the coast of neighboring Ibaraki Prefecture. The drifter data showed that this seeming anomaly was the result of a large circular flow, or eddy, that had trapped contamination close to shore south of the plant. 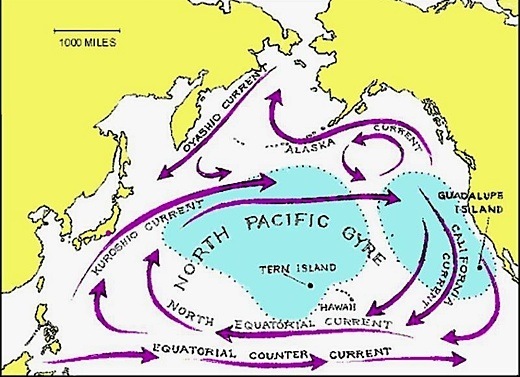 Over time, the researchers’ drifters helped to establish the routes and rate of radiation transported out into the wider ocean and revealed the complexity of currents in the region. A year after the drifters were released, WHOI oceanographer Steve Jayne showed that their circuitous tracks extended half way across the Pacific, remaining mostly north of the Kuroshio Current. Combined with surface-water samples taken by commercial “ships of opportunity” in a program organized by Aoyama, these data show cesium mixing down into the ocean and flowing east at a rate of about 7 kilometers per day. At that rate, Buesseler said at the November 2012 conference, it would take another year for small but measurable amounts of cesium to show up off the U.S. West Coast. 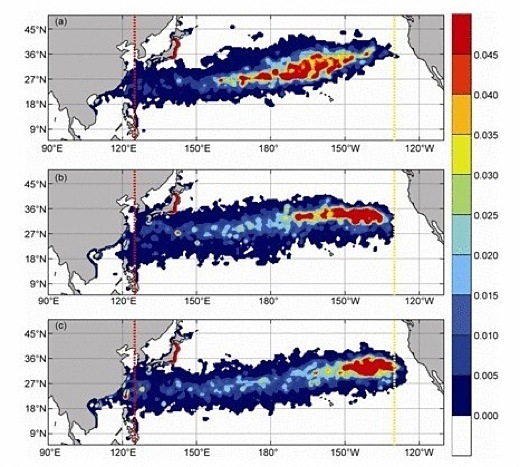 Lacking dipsticks in the ocean to measure the ongoing dispersal of radioisotopes, or regular research cruises, scientists must rely on mathematical ocean models to predict where radioactivity from Fukushima is flowing. These incorporate the best-known physics of ocean current dynamics, but modeling the unique currents off Japan’s Pacific coast can be a frustrating task, JAMSTEC’s Yukio Masumoto said at the Tokyo conference. Oyashio Current, which flows south from the Arctic Ocean. To take up this challenge, JAMSTEC has developed a nested system of models. Some cover wider territory, sacrificing detailed resolution; others provide more details by focusing in on smaller areas. The base model, called the Japan Coastal Ocean Prediction Experiment, or JCOPE, is a global-scale ocean simulator. currents. Tucked within the regional model, and offering still finer resolution, is JCOPET, a coastal model that can simulatetidal effects. Masumoto stressed that the accuracy of each of these dispersion models—and several others currently being run at his and other institutions in Japan and elsewhere—depends largely on actual measurements put into the models before they are set in motion. “The observed data are quite limited in time and space, and we cannot say which model is the best,” Masumoto said—especially given the ongoing uncertainty about the amount of radioisotopes that entered the ocean. 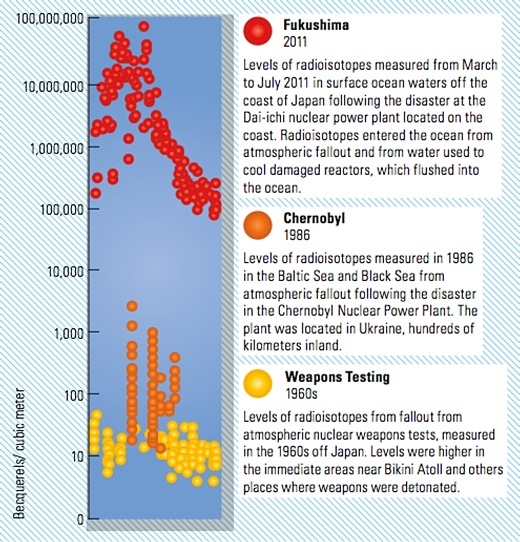 Image above: Chart of unprecedented releases of radioisotopes into the ocean. The amount of cesium-137 radioisotopes from the Fukushima disaster in surface ocean waters was 10,000 to 100,000 times greater than amounts that entered the ocean from the Chernobyl accident or atmospheric nuclear weapons tests. From original article. Buesseler reviewed the range of current estimates of the total cesium releases. Their totals vary widely, he noted, but are “beginning to converge” on a total cesium-137 release of between 15 and 30 petabequerels (10PBq = 10e15 Bq = 1,000 trillion Bq) . In comparative terms, he said, this is slightly more than the amount put into the sea by Chernobyl—although the total environmental release from that accident, at 85 PBq, was much higher. Of the fraction delivered as atmospheric fallout, most estimates lie between 10 and 15 PBq. The numbers for direct discharge, 3 to more than 15 PBq, are much less certain, Buesseler noted. Nor do these total numbers account for the release of other isotopes from lingering plant discharges, including strontium-90, which, although present in quantities much lower than cesium, is of concern: It accumulates in the bones of fish that could be eaten. To understand the ultimate fate of Fukushima cesium in the oceans, scientists will have to uncover not just the paths and speed of ocean currents that transport cesium across the Pacific, but also how cesium mixes into deeper layers of the ocean and how much accumulates in particles of organic detritus, or “marine snow,” that sinks down and settles on the seafloor. Smaller but ongoing radioactive inputs from rivers and groundwater in the vicinity are being reported by Japanese scientists, and will also have to be considered. Although some of these puzzle pieces are beginning to fit together, Buesseler said, significant gaps in knowledge remain. SUBHEAD:Surface and interior pathways of the Fukushima Cesium-137 radioactive plume in the Pacific Ocean. Image above: Distribution of Cesium 137 1.5 years (a), 3.5 years (b), and 4 years (c) after 3/11/11. Following the March 2011 Fukushima disaster, large amounts of water contaminated with radionuclides, including Cesium-137, were released into the Pacific Ocean. With a half-life of 30.1 years, Cs-137 has the potential to travel large distances within the ocean. Using an ensemble of regional eddy-resolving simulations, this study investigates the long-term ventilation pathways of the leaked Cs-137 in the North Pacific Ocean. The simulations suggest that the contaminated plume would have been rapidly diluted below 10,000 Bq/m3 by the energetic Kuroshio Current and Kurushio Extension by July 2011. Based on our source function of 22 Bq/m3, which sits at the upper range of the published estimates, waters with Cs-137 concentrations >10 Bq/m3 are projected to reach the northwestern American coast and the Hawaiian archipelago by early 2014. Driven by quasi-zonal oceanic jets, shelf waters north of 45°N experience Cs-137 levels of 10–30 Bq/m3 between 2014 and 2020, while the Californian coast is projected to see lower concentrations (10–20 Bq/m3) slightly later (2016–2025). This late but prolonged exposure is related to subsurface pathways of mode waters, where Cs-137 is subducted toward the subtropics before being upwelled from deeper sources along the southern Californian coast. The model suggests that Fukushima-derived Cs-137 will penetrate the interior ocean and spread to other oceanic basins over the next two decades and beyond. The sensitivity of our results to uncertainties in the source function and to inter-annual to multi-decadal variability is discussed.